This isn't the first time that Grey Ops has touched on infrared gaming, but the blog's home turf (Ottawa) is now home to a new business called Battlefield Live that is bringing laser gaming with a milsim flavour to the Ottawa area. I stumbled across the business while looking for another building in the city's Eastish end, and was quite surprised I hadn't heard of it previously (although I believe they may have opened up that physical location rather recently). 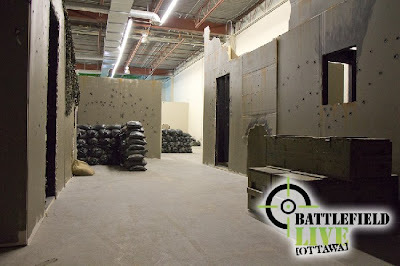 Battlefield Live uses a bevy of different laser weapons for the game, and they've constructed an interesting looking playing field within their physical location (but their arsenal can also be used outdoors, and they've mentioned online that they may be opening something up in the West end outdoors). There is a free gaming event occurring this weekend, so locals should be sure to check out this web page for more info. I have a few former co-workers going so I'll definitely ask them what their experience was like, and will post an addendum to this post based on their feedback. Best of luck to the Battlefield Live Ottawa crew, seems like it would be a lot of fun for many demographics. A view inside their Triole location. 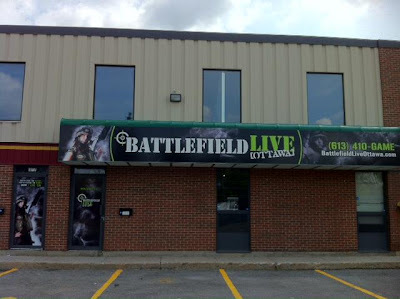 To check out other similar Battlefield Live businesses near you, check out this link.